The experience of our group of patients that are affected by magnesium-deficiency tetany  (among them 7 families) is that the prevalence and importance of this disease is generally not taken into consideration sufficiently. 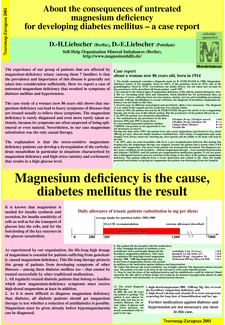 Here we report a case of untreated magnesium deficiency that resulted in symptoms of diabetes mellitus and hypertension. The case study of a woman (now 86 years old) shows that magnesium deficiency can lead to heavy signs of diseases that are treated only symptomatically to relieve these problems. The magnesium deficiency is rarely diagnosed and even more rarely taken seriously, because its symptoms are often suspected of being ephemeral or even hysterical [5,9]. Nevertheless, in our case magnesium substitution was the only causal therapy. The explanation is that the stress-sensitive magnesium-deficiency patients can develop a dysregulation of the carbohydrate metabolism in particular in situations characterised by magnesium deficiency and high stress  (anxiety and excitement) that results in a high glucose level. It is known that magnesium is needed for insulin synthesis and secretion, for insulin sensitivity of cells as well as for the transport of glucose into the cells, and for the functioning of the key enzymes in the glucose metabolism [1,2,4,7,10,11,12,14,15]. As experienced by our organisation, the life-long high dosage of magnesium is essential for patients suffering from genetically caused magnesium deficiency. This life-long therapy protects this group of patients from developing symptoms of other illnesses [3,13,16,17] - among them diabetes mellitus too - that cannot be treated successfully by purely symptomatical medications. All regularly treated diabetic patients that belong to families which show magnesium-deficiency symptoms must receive high-dosed magnesium at least in addition. As it is more difficult to diagnose magnesium deficiency than diabetes, all diabetic patients should get magnesium therapy to test whether a reduction of antidiabetics as well as antihypertensiva is possible. Magnesium must be given already before hypomagnesiaemia can be diagnosed. 1. The family anamnesis contains a diagnosis by R. FEHLINGER in 1980: Magnesium-deficiency tetany of the daughter (born in 1947), of the grandson (born in 1972) and of the granddaughter (born in 1974). Nevertheless, the family history was not taken into account by the practitioners of the described patient - until 1997. 2. In contrast to the clinical signs of magnesium deficiency of the elderly patient during her whole life (i.e. becoming easily tired and exhausted, which disabled her for professional duty, no tolerance of stress, suffering from nervous tension, anxiety, nervous and trembling movements, unsteady walking, unwillingness to accept criticism), the diagnosis of hereditary magnesium deficiency was not made in that time . 3. Several stays in different neurological and psychiatric clinics were necessary. The diagnosis of a so-called brain-organic psycho-syndrome was repeatedly found. 4. Only in 1991, the patient was seen by R. FEHLINGER. He gave the advice to try a magnesium therapy also in the case of this elderly patient. But the practitioners of the patient did not do so. 5. In 1992 the patient was absolutely immobilised. 6. The medication by the practitioner in the time between 1992 and 1997 is shown here. If a non-insulin-dependent diabetes mellitus (NIDDM) was present at all, apparently it was not necessary to treat it. During that time (after 1991) the patient took only rarely magnesium (and dosed too low, about 300 mg per day) when the family members reminded her. After intake of magnesium salts some changes were always observed: cheering up, clear speech and the ability to sit with help in the bed. 7. In 1997, after an acute bronchitis with fever a new hospitalisation followed. But during this hospital stay the magnesium therapy was stopped, because the patient had a serum value of 0.8 mmol/liter magnesium. The stress of the patient was dramatically increased. The diagnoses under stress conditions in the hospital - without magnesium therapy - were essential hypertension and diabetes (NIDDM), and the patient got symptomatical medication against. It was not possible to distinguish between adverse reactions of the drugs or the effect of the primary magnesium deficiency. The patient suffered from a severe depression and wished to die. After the family protested and insisted on giving her magnesium the patient was discharged from the hospital. 8. The patient left the hospital with this medication. 9. After changing the place of residence a new practitioner and a neurologist diagnosed the hereditary magnesium deficiency. After that, a continuous life-long high-dosed magnesium therapy (900 - 1200 mg magnesium per day in the form of magnesium citrate) was started in addition to the medication against diabetes and hypertension. 10. Under this therapy the stress sensitivity was strongly reduced. The depression phases became rare. The patient was able to sit in the bed alone and to write some cheerful poems. 11. Step by step the doses of the antihypertensiva and the antidiabetics could be reduced. Simultaneously the side effects of these drugs were reduced, for instance hypoglycemic phases in spite of the treatment with metformin, or occasional mental absence. high-dosed calcium and vitamin D to treat osteoporosis respecting the long time of immobilisation and her age. The patient is now almost without pain and has no secondary illnesses. The serum values of glucose and the blood pressure are nearly normalised with regard to her age. Further medications against diabetes and hypertension are not necessary any more in this case. Am. Diabetes Assoc. : Magnesium supplementation in the treatment of diabetes. Diabetes Care 14, 1065-1067 (1992). Balon, T. et al. : Evidence that dietary magnesium supplementation prevents the development of diabetes in a rat model of spontaneous NIDDM. diabetes (suppl.1) 88A (1994). Classen, H.G. et al. : Magnesium: Indications on diagnosis and therapy in human medicine. Magnes.Bull. 8, 127-135 (1986). DeValk, H.W. : Magnesium in diabetes mellitus (Review): Neth.J.Med. 54, 139-146 (1999). Fehlinger, R., K. Seidel: The hyperventilation syndrome: a neurosis or a manifestation of magnesium imbalance? Magnes. Bull. 4, 129-136 (1985). Fehlinger, R.: The heritability of tetanic syndrome. Magnes.Bull. 17, 104-108 (1995). Guerrero-Romero, F., M.Rodriguez-Moran, M.: Hypomagnesemia is linked to low serum HDL-cholesterol irrespective of serum glucose values. J.Diab.Compl. 14, 272-276 (2000). Liebscher, D.-H., D. Fauk: Late high-dosed magnesium therapy in the case of a 83-year-old woman with magnesium-deficiency tetany. Magnes.Bull. 22, 100-101 (2000). Liebscher, D.-H., D.-E. Liebscher: About the difficulties in diagnosis of magnesium-deficiency tetany by practitioners from the view of patients. 9th Int.Magnes.Sympos. 2000, Vichy, Abstract. Mahalingam, B. et al. : Structural model of human glucokinase in complex with glucose and ATP. Implications for the mutants that cause hypo- and hyperglycemia. Diabetes 48, 1698-1705 (1999). McNair, P. et al. : Renal hypomagnesaemia in human diabetes mellitus: Its relation to glucose homeostasis. Eur.J.Clin.Invest. 12,81-85 (1982). Nadler, J.L. et al. : Magnesium deficiency produces insulin resistance and increased thromboxane synthesis. Hypertension 21, 1024-1029 (1993). Nadler, J.L., R.K. Rude: Disorders of magnesium metabolism. Endocrin.Metab.Clinics North.Am. 24, 623-641 (1995). Paolisso, G., M. Barbagallo: Hypertension, diabetes mellitus, and insulin resistance - The role of intracellular magnesium. Am.J.Hypertension 10, 346-355 (1997). Reis, M.A.B. et al. : Magnesium deficiency modulates the insulin signaling pathway in liver but not muscle of rats. J.Nutr. 130, 133-138 (2000). Rude, R.K. (1998): Magnesium deficit: a cause of heterogeneous disease in humans. J.Bone Mineral Res. 13, 749-758 (1998). Saris, N.-E.L. et al. : Magnesium - An update on physiological, clinical and analytical aspects. Clin.Chim.acta 294, 1-26 (2000). Seelig, M.S. : Consequences of magnesium deficiency on the enhancement of stress reactions; preventive and therapeutic implications (a review). J.Am.Coll.Nutr. 13, 429-446 (1994).